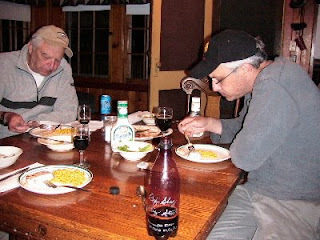 This - another contemporaneous Shag Lake update e-mail back posted in the blog as part of the continuing effort to accurately document the consumption of the Big Shag Big Stout 12- pack. Numerologically, this would seem not to be a very happy update. Perhaps the better part of valor might be to skip directly to update 14 in another day or two ... But lets throw caution to the wind and press on. This is the sight that greeted me after seeing Roy and Harlan off Sunday morning. I think this picture speaks for itself. 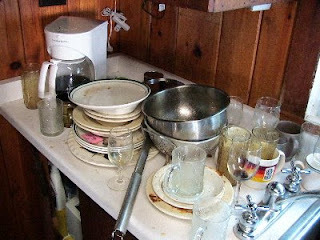 My task here was made doubly difficult as I have been unable to locate the automatic dishwasher the boys were using during their service here. Until I locate it, we have changed our eating habits at Shag. Dad and I are now sharing exactly one glass and one fork for all meals, and eating only off of paper plates. More on this picture later. 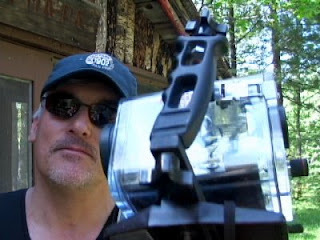 Now as requested by Wendy: Pictures of Me - mostly using my cell phone camera. 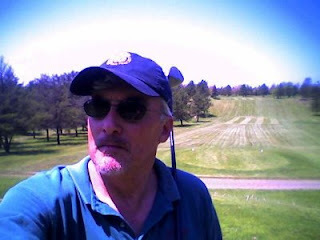 Me at Red Fox Run on Saturday: My tee shot on 13 (missed birdie - got par) and standing in the tee-box on 17 (my drive is 240 over my shoulder at the top of the hill in the center of the fairway). 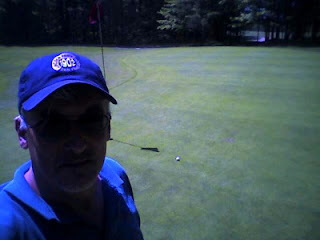 I did not score as well as I would have liked, as my caddy was a no-show and I had to carry my own bag. Later the same day. 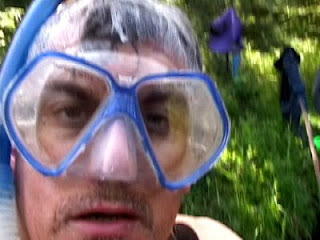 Me preparing to snorkel and shoot underwater video in the Escanaba at lil' camp. 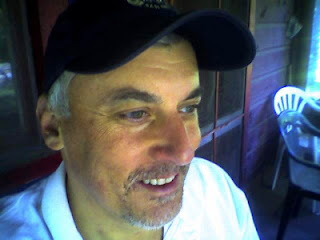 Picture of Me relaxing on lil camp porch - apres swim, while Harlan fished. I sent this picture to Sigrid to remind her what I look like. She said that if I don't shave to not bother coming home. I think she is joking. 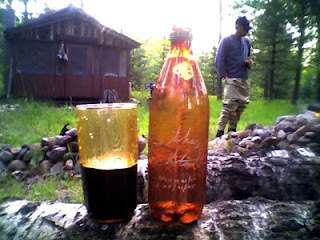 With Harlan back from the river, we decided to enjoy the moment with Big Shag Big Stout # 7 of 12. 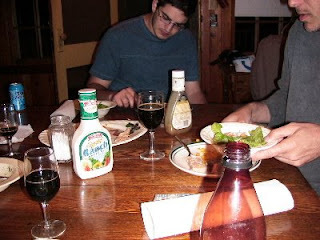 Wendy, sorry about including Harlan here, but I could not find a picture of just me with the stout..
That night, our last night together this trip, over a dinner of perfectly grilled swordfish and salmon prepared by Master Weber Chef Harlan, we decided to celebrate and share an additional bottle of Big Shag Big Stout (#8 of 12). Roy was included with a small sample for this special occasion. Roy behaved a little oddly, first leaving the table when the camera appeared, then hiding his beer wielding arm under the table. Roy, in case you are wondering why I felt compelled to point this out, please refer to photo #1 above. 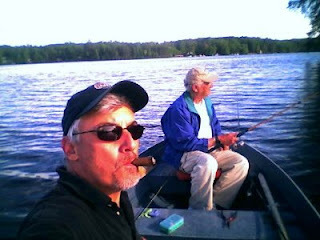 And to bring us up to date, Dad I motored to Jacobson's Bay late this afternoon for a little bass fishing. No keepers this trip.